Thanks to Wonderwoman Creations for my first award! It's nice to know someone is enjoying my blog! Put the logo on your blog. Pass the award on to 10 bloggers. 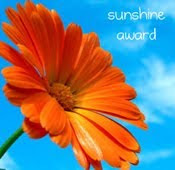 Let the nominees know that they have received this award by commenting on their blog. I'm thrilled to pass the sunshine on to others who make me happy. Oh, wow, Kalleen! Thank you so much for the award! That is so sweet of you - I'm in fine company with the others you listed! Kalleen likes me! She really does! (*happy dance*). Oh by the way, I've got 3 animals finished. Maybe I can run them up on Thursday if I have time. Or I can leave them at my mom's. Thanks for the award! It's purdy!